There’s an emerging trend in the modern workplace. Instead of saying, “I want to work for you,” job candidates are asking, “Why should I come to work for you?” Recruits and employees alike are looking for purposeful jobs with engaged leaders who seek a higher value proposition than just the bottom line. It’s with that proposition in mind that the Center for Leadership (CFL) at Florida International University has continually reviewed the leadership programs it first launched in 2007. Then as now, CFL founders envision a novel type of executive education program. Driven by intense research and a fresh approach to customized leadership development programs for organizational partners, they combine theory, real-world application, reflection, peer-to-peer learning, and critical feedback to meet specific organizational and executive needs. In the process, leaders find their teams are better served as well. 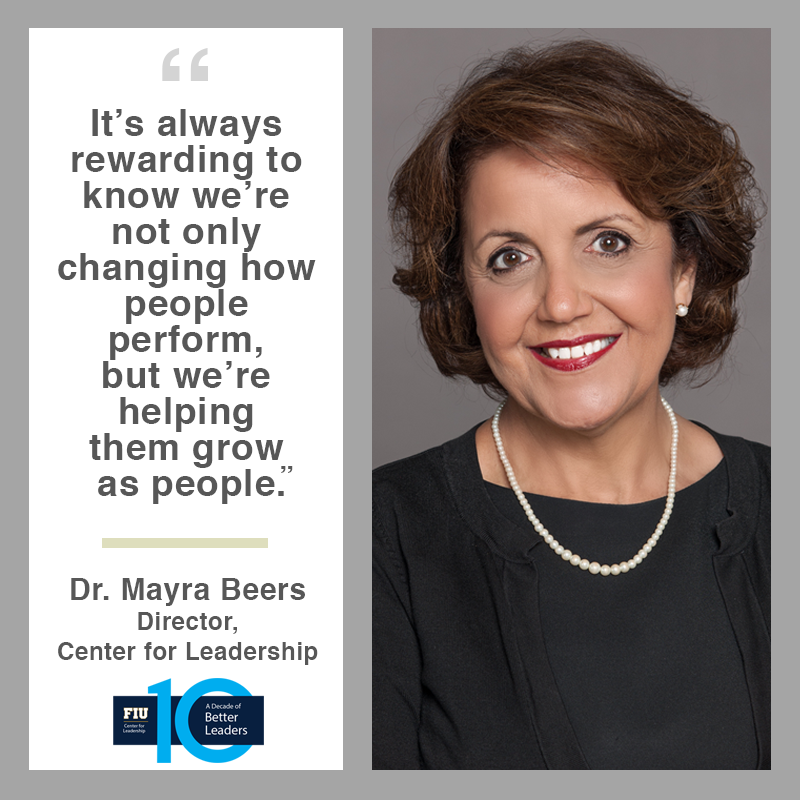 “During the last decade, the programs have become what we first envisioned,” says founding Director, Dr. Mayra Beers. She notes that a focus on research and its practical application was fundamental in creating The Center’s infrastructure, including its board of advisors, educational programming, lecture series, and community partnerships. Over the years, The Center’s program curriculum has grown to include The High-Impact Leadership Program, The Women Leaders Program, and The Senior Executive Leaders Program. Each integrates cutting-edge research, expertise with physical and personality assessments, introspection, and factual analysis to provide leaders with best practices. To date, more than 2,000 executive-level decision makers across 170 organizations from around the world – including almost 400 principals from South Florida’s public schools – have participated in the programs. Research must inform leadership development programs. Basing Center programs on empirical research was just the start. What competencies do leaders need today – and tomorrow? Center research in 2007 informed the first programs then – constantly updating and evaluating the best research continues to inform how program design and delivery. For example, consultancies and business magazines often discussed the need to address women leaders’ weaknesses, not strengths. The first Center program a decade ago, however, empowered women to leverage their strengths in order to assume their rightful role as leaders, and to take action on what matters to them. “Now the industry is catching up with us,” Beers says. Dr. Beers has found two recurring sources of validation to The Center’s work. One comes when participants surveyed offer evaluations of the program’s rigor, operations, faculty, and integrity consistently averaging at the very top of the range. An even greater measure to Dr. Beers comes when participants subsequently report heightened professional success among their teams, at their organizations, and through promotions – and even report back that their families find them happier at home. For more information on the Center for Leadership’s award-winning programs, visit lead.fiu.edu/programs.